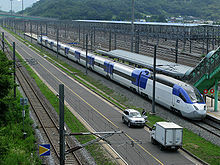 Korea Train eXpress (KTX, 케이티엑스 Kei-ti-ek-seu) is South Korea's high-speed rail system, operated by Korail. Construction began on the high-speed line from Seoul to Busan in 1992. KTX services were launched on April 1, 2004. From Seoul Station the KTX lines radiate with stops at Seoul Station, Yongsan Station towards Busan and Gwangju, and from Gangnam District's Suseo Station with intermediate stations in New Dongtan City and Seoul Subway Line 1's Jije Station in Pyeongtaek. A new line from Wonju to Gangneung was completed in December 2017 to serve the 2018 Winter Olympics in Pyeongchang. Top speed for trains in regular service is currently 305 km/h (190 mph), though the infrastructure is designed for 350 km/h (217 mph). The initial rolling stock was based on Alstom's TGV Réseau, and was partly built in Korea. The domestically developed HSR-350x, which achieved 352.4 km/h (219.0 mph) in tests, resulted in a second type of high-speed trains now operated by Korail, the KTX Sancheon. The next generation KTX train, HEMU-430X, achieved 421.4 km/h in 2013, making South Korea the world's fourth country after Japan, France and China to develop a high-speed train running on conventional rail above 420 km/h. The Seoul-Busan axis is Korea's main traffic corridor. In 1982, it represented 65.8% of South Korea's population, a number that grew to 73.3% by 1995, along with 70% of freight traffic and 66% of passenger traffic. With both the Gyeongbu Expressway and Korail's Gyeongbu Line congested as of the late 1970s, the government saw the pressing need for another form of transportation. The first proposals for a second Seoul-Busan railway line originated from a study prepared between 1972 and 1974 by experts from France's SNCF and Japan Railway Technical Service on a request from the IBRD. A more detailed 1978-1981 study by KAIST, focusing on the needs of freight transport, also came to the conclusion that separating long-distance passenger traffic on a high-speed passenger railway would be advisable, and it was adopted in the following Korean Five Year Plan. During the following years, several feasibility studies were prepared for a high-speed line with a Seoul–Busan travel time of 1 hour 30 minutes, which gave positive results. In 1989, following the go-ahead for the project, the institutions to manage its preparation were established: the Gyeongbu High Speed Electric Railway & New International Airport Committee, and the High Speed Electric Railway Planning Department (later renamed HSR Project Planning Board). In 1990, the planned Seoul–Busan travel time was 1 hour 51 minutes, the project was to be completed by August 1998, and costs were estimated at 5.85 trillion South Korean won in 1988 prices, 4.6 trillion of which were to be spent on infrastructure, the remainder on rolling stock. As planning progressed, the Korea High Speed Rail Construction Authority (KHSRCA) was established in March 1992 as a separate body with its own budget responsible for the project. In the 1993 reappraisal of the project, the completion date was pushed back to May 2002, and cost estimates grew to 10.74 trillion won. 82% of the cost increase was due to a 90% increase in unit costs in the construction sector, mostly labour costs but also material costs, and the remainder due to alignment changes. To finance the project, the option of a build-operate-transfer (BOT) franchise was rejected as too risky. Funding included direct government grants (35%), government (10%) and foreign (18%) loans, domestic bond sales (31%) and private capital (6%). KHSRCA started construction of the Seoul–Busan Gyeongbu high-speed railway (Gyeongbu HSR) on June 30, 1992, on the 57 km (35 mi) long section from Cheonan to Daejeon, which was intended for use as test track. Construction started before the choice of the main technology supplier, thus alignment design was set out to be compatible with all choices. Of the planned 411 km (255 mi) line, 152.73 km (94.90 mi) would be laid on bridges, and another 138.68 km (86.17 mi) in tunnels. However, plans were changed repeatedly, in particular those for city sections, following disputes with local governments, while construction work suffered from early quality problems. Planned operating speed was also reduced from 350 km/h (217 mph) to the 300 km/h (186 mph) maximum of high-speed trains on the market. Three competitors bid for the supply of the core system, which included the rolling stock, catenary and signalling: consortia led by GEC-Alsthom, today Alstom, one of the builders of France's TGV trains; Siemens, one of the builders of Germany's ICE trains; and Mitsubishi, one of the builders of Japan's Shinkansen trains. In 1994, the alliance of GEC-Alsthom and its Korean subsidiary Eukorail were chosen as winner. The technology was almost identical to that found on the high-speed lines of France's TGV system. Track-related design specifications included a design speed of 350 km/h (217 mph) and standard gauge. Following the 1997 Asian Financial Crisis, the government decided to realise the Gyeongbu HSR in two phases. In a first phase, two-thirds of the high-speed line between the southwestern suburbs of Seoul and Daegu would be finished by 2004, with trains travelling along the parallel conventional line along the rest of the Seoul–Busan route. The upgrade and electrification of these sections of the Gyeongbu Line was added to the project, and also the upgrade and electrification of the Honam Line from Daejeon to Mokpo, providing a second route for KTX services. The budget for the first phase was set at 12,737.7 billion won, that for the entire project at 18,435.8 billion won in 1998 prices. While the share of government contributions remained unchanged, the share of foreign loans, domestic bond sales and private capital changed to 24%, 29% and 2%. The infrastructure and rolling stock were created in the framework of a technology transfer agreement, which paired up Korean companies with core system supplier Alstom and its European subcontractors for different subsystems. Alstom's part of the project amounted to US$2.1 billion or €1.5 billion. Well ahead of the opening of the Gyeongbu HSR for regular service, in December 1999, 34.4 km (21.4 mi) of the test section, later extended to 57 km (35 mi), was finished to enable trials with trains. After further design changes, the high-speed tracks were finished over a length of 223.6 km (138.9 mi), with 15.0 km (9.3 mi) of interconnections to the conventional Gyeongbu Line, including at a short interruption at Daejeon. The high-speed section itself included 83.1 km (51.6 mi) of viaducts and 75.6 km (47.0 mi) of tunnels. Conventional line electrification was finished over the 132.8 km (82.5 mi) across Daegu and on to Busan, the 20.7 km (12.9 mi) across Daejeon, and the 264.4 km (164.3 mi) from Daejeon to Mokpo and Gwangju. After 12 years of construction and with a final cost of 12,737.7 billion won, the initial KTX system with the first phase of the Gyeongbu HSR went into service on April 1, 2004. The Daegu–Busan section of the Gyeongbu HSR became a separate project with the July 1998 project revision, with a budget of 5,698.1 billion won, with funding from the government and private sources by the same ratios as for phase 1. In August 2006, the project was modified to again include the Daejeon and Daegu urban area passages, as well as additional stations along the phase 1 section. For these additions, the budget as well as the government's share of the funding was increased. Construction started in June 2002. The 128.1 km (79.6 mi) line, which follows a long curve to the northeast of the existing Gyeongbu Line, includes 54 viaducts with a total length of 23.4 km (14.5 mi) and 38 tunnels with a total length of 74.2 km (46.1 mi). The two largest structures are the 20,323 m (66,677 ft) Geomjeung Tunnel, under Mount Geumjeong at the Busan end of the line; and the 13,270 m (43,540 ft) Wonhyo Tunnel, under Mount Cheonseong south-west of Ulsan, which will be the longest and second longest tunnels in Korea once the line is opened. A long dispute concerning the environmental impact assessment of the Wonhyo Tunnel, which passes under a wetland area, caused delays for the entire project. The dispute gained nationwide and international attention due to the repeated hunger strikes of a Buddhist nun, led to a suspension of works in 2005, and only ended with a supreme court ruling in June 2006. With the exception of the sections across Daejeon and Daegu, the second phase went into service on November 1, 2010. By that time, 4,905.7 billion won was spent out of a second phase budget, or 17,643.4 billion won out of the total. The two sections across the urban areas of Daejeon and Daegu, altogether 40.9 km (25.4 mi), will be finished by 2014. As of October 2010, the total cost of the second phase was estimated at 7,945.4 billion won, that for the entire project at 20,728.2 billion won. The last element of the original project that was shelved in 1998, separate underground tracks across the Seoul metropolitan area, was re-launched in June 2008, when an initial plan with a 28.6 km (17.8 mi) long alignment and two new stations was announced. The electrification and the completion of the re-alignment and double-tracking of the Jeolla Line, which branches from the Honam Line at Iksan and continues to Suncheon and Yeosu, began in December 2003, with the aim to introduce KTX services in time for the Expo 2012 in Yeosu. The upgrade will allow to raise top speed from 120 to 180 km/h (75 to 112 mph). The section of the perpendicular Gyeongjeon Line from Samnangjin, the junction with the Gyeongbu Line near Busan, to Suncheon is upgraded in a similar way, with track doubling, alignment modifications and electrification for 180 km/h (112 mph). The until Masan was opened on December 15, 2010. The upgrade is to be complete until Jinju by 2012 and Suncheon by 2014. The top speed of the AREX line, Seoul's airport link, is to be raised from 110 to 180 km/h (68 to 112 mph) for the KTX. The Ulsan–Gyeongju–Pohang section of the Donghae Nambu Line is foreseen for an upgrade in a completely new alignment that circumvents downtown Gyeongju and connects to the Gyeongbu High Speed Railway at Singyeongju Station, allowing for direct KTX access to the two cities. On April 23, 2009, the project was approved by the government and a ground-breaking ceremony was held. The altogether 76.56 km (47.57 mi) line is slated to be opened in December 2014. On September 1, 2010, the South Korean government announced a strategic plan to reduce travel times from Seoul to 95% of the country to under 2 hours by 2020. The main new element of the plan is to aim for top speeds of 230–250 km/h (143–155 mph) in upgrades of much of the mainline network with view to the introduction of KTX services. The conventional lines under the scope of the plan include the above, already on-going projects, and their extensions along the rest of the southern and eastern coasts of South Korea, lines along the western coast, lines north of Seoul, and the second, more easterly line between Seoul and Busan with some connecting lines. Until 2006, the first plans for a second, separate high-speed line from Seoul to Mokpo were developed into the project of a line branching from the Gyeongbu HSR and constructed in two stages, the Honam High Speed Railway (Honam HSR). The budget for the 185.75 km (115.42 mi) first stage, from the new Osong Station on the Gyongbu HSR to Gwangju·Songjeong Station, was set at 8,569.5 billion won. The second stage, the 48.74 km (30.29 mi) remaining to Mokpo, was to be finished by 2017 with a budget of 2,002.2 billion won. The Osong-Iksan section of the first phase is also intended for use as high-speed test track for rolling stock development, to be fitted with special catenary and instrumented track. The ground-breaking ceremony was held on December 4, 2009. As of September 2010, progress was 9.6% of the project budget then estimated at 10,490.1 billion won for the first phase, which was due for completion in 2014, while the estimate for the entire line stood at 12,101.7 billion won. First plans for the Honam HSR foresaw a terminus in Suseo Station, southeast Seoul. The branch to Suseo was re-launched as a separate project, the Suseo High Speed Railway (Suseo HSR), in June 2008. Detailed design of the 61.1 km (38.0 mi) line is underway since September 2010, with opening planned by the end of 2014. For the longer term, new high-speed lines from Seoul to Sokcho on the eastern coast, and a direct branch from the Gyeongbu HSR south to Jinju and further to the coast are under consideration. In conjunction with the award of the 2018 Winter Olympics to PyeongChang in July 2011, KTX service via the eastern coast line was anticipated; the expected travel time there from Seoul is 50 minutes. The initial KTX-I trainsets, also known as simply KTX or as TGV-K, are based on the TGV Réseau, but with several differences. 46 trains were built - the initial twelve in France by Alstom, the remainder in South Korea by Rotem. The 20-car electric multiple units consist of two traction heads, that is powered end cars without passenger compartment, and eighteen articulated passenger cars, of which the two extreme ones have one motorised bogie each. A KTX-I was built to carry up to 935 passengers at a regular top speed of 300 km/h (186 mph), later increased to 305 km/h (190 mph). The technology transfer agreement for the KTX-I did not provide for a complete control of manufacturing processes and some parts had to be imported. To increase the domestic added value, in 1996, an alliance of South Korean government research agencies, universities and private companies started a project named G7 to develop domestic high-speed rail technology. The main element of the G7 project was the 7-car experimental high-speed train HSR-350x, originally intended as the prototype of a train with 20-car and 11-car versions for 350 km/h (217 mph) commercial service. The train was also known under the names G7, KHST and NG-KTX, and was later officially renamed Hanvit 350. The train was developed on the basis of the transferred TGV technology, but more advanced technology was used for the new motors, power electronics and additional brake systems, while the passenger cars were made of aluminum to save weight, and the nose was a new design with reduced aerodynamic drag. Test runs were conducted between 2002 and 2008, in the course of which HSR-350x achieved the South Korean rail speed record of 352.4 km/h (219.0 mph) on December 16, 2004. For less frequented relations and for operational flexibility, a 2001 study proposed a train created by scaling down the planned commercial version of the HSR-350x, by shortening the train, removing powered bogies from intermediate cars, and lowering top speed. Hyundai Rotem received orders for altogether 24 such trains, called KTX-II, in three batches from July 2006 to December 2008. Design speed is 330 km/h (205 mph), and revenue service speed is 305 km/h (190 mph). The power electronics uses newer technology than the HSR-350x, and the front is a new design, too. The trainsets, of which two can be coupled together, consist of two traction heads and eight articulated passenger cars, and seat 363 passengers in two classes, with enhanced comfort relative to the KTX-I. The domestic added value of the trains was increased to 87%, compared to 58% for the KTX-I. Imported parts include the pantographs, semiconductors in the power electronics, front design, couplers and final drives. The KTX-II was officially renamed as KTX-Sancheon (Hangul: KTX-산천) after the Korean name of the indigenous fish cherry salmon before the first units started commercial service on March 2, 2010. However within weeks of its initial launch, mechanical and design flaws began to appear, in some cases causing trains to stop running and forcing passengers to leave the train and walk back to the station, and in one particular case derailing from the tracks on February 11, 2011. Although the trains were designed to be a domestically-built replacement for the French built Alstrom trains, due to over 30 malfunctions since March 2, 2010, Korail asked manufacturer Hyundai-Rotem to recall all 19 of the trains in operation after finding cracks in two anchor bands in May 2011. Following the recall, the KTX-Sancheon trains were put back in service. In 2007, an alliance of government research institutes, universities and private companies launched the project to build a second experimental high-speed train, named HEMU-400X (later renamed to HEMU-430X). With a budget of 97.4 billion won and a timetable lasting 6 years, the aim was to develop an experimental train capable of reaching 400 km/h (249 mph) in tests, as a basis for commercial trains operating at 350 km/h (217 mph). Unlike all previous South Korean high-speed trains, the 6-car HEMU-400X will be fitted with distributed traction. Detailed plans were presented in October 2010, when the train was expected to be completed in 2011 and to start line tests in 2012. It was later renamed HEMU-430X, which achieved 421.4 km/h on the last day of March 2013, making South Korea the world's fourth country after Japan, France and China to develop a high-speed train running on conventional rail above 420 km/h. KTX-III, the commercial derivative of HEMU-430X, is expected to enter service in 2015. KTX-III was intended to cut Seoul-Busan travel times to 1 hour 50 minutes with a maximum operating speed of 350 km/h (217 mph). The targeted top speed was later increased to 370 km/h (230 mph). In default configuration, the train is to seat 378 passengers in 8 cars, of which only the two driving trailers will be unpowered. EMU-250 is expected to enter the service for Gyeongjeon line with newly built section Bujeon - Masan, in 2021. The name of train displays its original targeted top speed 250 km/h (155 mph), although later it is increased to 260 km/h (162 mph), with the designed maximum 286 km/h (178 mph). Although EMU-250 is a high speed train, its base will be different from former KTX. 19 trainsets (in which 6 sets are dedicated to Gyeongjeon Line) are newly ordered from KORAIL to Hyundai Rotem, and will be tested in 2019-2020. Each trainset has 6 cars with more than 381 passenger seats. Planned Honam HSR (Phase 2) Gwangju-Songjeong - Mokpo ? 2019 (expected) ? ? Following a phase of test operation, regular KTX service started on April 1, 2004, with a maximum speed of 300 km/h (186 mph) achieved along the finished sections of the Gyeongbu HSR. In response to frequent passenger complaints regarding speeds on the video display staying just below the advertised 300 mark, operating top speed was raised to 305 km/h (190 mph) on November 26, 2007. KTX services are grouped according to their route, and within the groups, the stopping pattern changes from train to train. KTX trains not deviating from the Seoul–Busan corridor are operated as the Gyeongbu KTX service. In 2004, the new service cut the route length from 441.7 to 408.5 km (274.5 to 253.8 mi), and the fastest trains, serving four stations only, cut the minimum Seoul–Busan travel time from the Saemaul's 4 hours 10 minutes to 2 hours 40 minutes. With the extension of the Gyeongbu HSR, from November 1, 2010, the minimum Seoul–Busan travel time reduced to 2 hours 18 minutes, over a travel distance of 423.8 km (263.3 mi). From December 1, 2010, Korail added a pair of non-stop trains with a travel time of 2 hours 8 minutes. Once the sections across Daejeon and Daegu are completed, cutting the Seoul–Busan travel distance to 417.5 km (259.4 mi), plans foresee a further improvement of the four-stop travel time to 2 hours and 10 minutes. Some Gyeongbu KTX services use parts of the conventional line paralleling the high-speed line. From June 2007 until October 2010, some trains left the Gyeongbu HSR between Daejeon and Dongdaegu to serve Gimcheon and Gumi before the opening of an extra station for the two cities on the high-speed line. From November 1, 2010, when most Gyeongbu KTX services began to use the new Daegu–Busan high-speed section, some trains remained on the Gyeongbu Line on that section, and additional trains began to use the Gyeongbu Line on the Seoul–Daejeon section to serve Suwon. KTX trains using the Gyeongbu HSR only from Seoul to Daejeon and continuing all along the Honam Line are operated as the Honam KTX service. In 2004, the new service with a route length of 404.5 km (251.3 mi) between Yongsan in Seoul and Mokpo cut minimum travel time from 4 hours 42 minutes to 2 hours 58 minutes. By 2017, this time is to be cut further to 1 hours 46 minutes. On December 15, 2010, the new Gyeongjeon KTX service started with a minimum travel time of 2 hours 54 minutes over the 401.4 km (249.4 mi) long route between Seoul and Masan. The service is to be extended to Jinju by 2012. A fourth line, the Jeolla KTX service will connect Seoul to Yeosu in 3 hours 7 minutes from September 2011. From 2014, with the completion of the first phase of the Honam HSR, the travel time is reduce further to 2 hours 25 minutes. From 2015, KTX trains are to reach Pohang from Seoul in 1 hour 50 minutes. KTX offers two classes: First Class and Standard Class. Tickets also specify whether a seat is forward-facing or backward-facing according to the direction of travel. There are special reserved Family seats, which are grouped in four, including 2 forward-facing and 2 backward-facing seats. There are reserved seats and unassigned seats. KTX trains have no restaurant cars or bars, only seat service. From 2006, one car of selected KTX services functions as a moving cinema. KTX fares were designed to be about halfway between those for conventional trains and airline tickets. The fare system implemented at the start of service in April 2004 deviated from prices proportional with distance, to favour long-distance trips. On April 25, 2005, fares were selectively reduced for relations under-performing most. From November 1, 2006, due to rising energy prices, Korail applied an 8-10% fare hike for various train services, including 9.5% for KTX. The price of a Seoul-Busan Standard Class ticket increased to 48,100 won. From July 1, 2007, KTX fares were hiked another 6.5%, while those for the slower Saemaeul and Mugunghwa services on the parallel conventional route were raised by 3.5 percent and 2.5 percent, respectively. However, new reduced weekday and unassigned seat fares were also introduced. After the November 1, 2010, start of service on the Daegu–Busan section of the Gyeongbu HSR, the fare for KTX trains using the new section was set about 8% higher than for the old route via Miryang, while that for the new services via Suwon was set lower. Korail's standard discounts for children, disabled, seniors and groups apply on KTX trains, too. For frequent travellers, Korail's standard discount cards, which are categorised according to age group, apply with the double of the standard discount rates; while discount cards for business and government agency workers apply with the normal rate; both types of discounts are up to 30%. Season period tickets with discounts of up to 60% can also apply to KTX trains. Discounts for family seats (37.5%) and backward facing seats (5%) are specific to the KTX. In addition to Korail's small general discounts for tickets purchased in a vending machine, via cell phone or the internet, discounts of 5–20% apply to a limited number of seats on KTX trains when purchased in advance. For travellers who transfer to other long-distance trains towards destinations beyond KTX stops, transfer tickets with 30% discount apply. Korail pays a refund for late KTX trains, which reaches 100% for trains with a delay above one hour. Korea Rail Pass, a period ticket Korail offers to foreigners, also applies to KTX. For passengers using the Korea-Japan Joint Rail Pass, a joint offer of Korail, Japanese railways and ferry services, the discount on KTX trains is 30%. When the project was launched, KTX was expected to become one of the world's busiest high-speed lines. The first study in 1991 forecast around 200,000 passengers a day in the first year of operation, growing to 330,000 passengers a day twelve years later. In forecasts prepared after the decision to split the project into two phases, the expected first year ridership of Gyeongbu KTX services was reduced by about 40%. With the estimate for the Honam KTX services added to the plan, opening year forecasts ranged between 150,000 and 175,000 passengers a day. Actual initial ridership after the opening of the first phase in 2004 was well short of initial expectations at around half of the final forecast. In October 2010, before the opening of the second phase, Korail expected ridership to rise from the then current 106,000 to 135,000 passengers a day. KTX was introduced on 1 April 2004. In the first 100 days, daily passenger numbers averaged 70,250, generating an operational revenue of about 2.11 billion won per day, 54% of what was expected. On January 14, 2005, Prime Minister Lee Hae Chan stated that "the launch of KTX was a classic policy failure" due to construction costs significantly above and passenger numbers well below forecasts. However, ridership increased by over a third on the Gyeongbu KTX and over a half on the Honam KTX in two years. Daily operating profit rose to 2.8 billion won by December 2005, when financial break-even was forecast at a ridership level of around 100,000 passengers a day, which was expected by the end of 2006. The 100 millionth rider was carried after 1116 days of operation on April 22, 2007, when cumulative income stood at 2.78 trillion won. KTX finances moved into the black in 2007. The next year, with revenues equal to US$898 million and costs equal to US$654 million, KTX was Korail's most profitable branch. By the sixth anniversary in April 2010, KTX trains travelled a total 122.15 million kilometres, carrying 211.01 million passengers. Punctuality gradually improved from 86.7% of trains arriving within 5 minutes of schedule in 2004 to 98.3% in 2009. In 2009, the average daily ridership was 102,700. As of April 2010, the single-day ridership record stood at 178,584 passengers, achieved on January 26, 2009, the Korean New Year. By the tenth anniversary KTX had travelled a total 240 million kilometres, carrying 414 million passengers. The introduction of high-speed services had the strongest effect on long-distance relations with a significant portion of the journey on the high-speed line, like Seoul–Busan: KTX took both the majority of the market and the bulk of rail passengers in the first year already, increasing the total share of rail from around two-fifths to a market dominating two-thirds by 2008. On long-distance relations with significant distances along conventional lines and resulting more modest travel time gains, that is along the Honam Line, the KTX and overall rail market share gain decreases with distance. On medium-distance relations like Seoul–Daejeon, KTX gained market share mostly at the expense of normal rail express services and air traffic, and helped to increase the total share of rail. On short distance intercity relations line Seoul–Cheonan, due to the modest gains in time and the location of KTX stops outside city cores, KTX gains were at the expense of conventional rail, while intercity rail's modal share was little changed. By 2007, provincial airports suffered from deficits after a drop in the number of passengers attributed to the KTX. With lower ticket prices, by 2008, KTX has swallowed up around half of the airlines' previous demand between Seoul and Busan (falling from 5.3 million passengers in 2003 to 2.4 million). Though some low-cost carriers failed and withdrew from the route, others still planned to enter competition even at the end of 2008. Budget airlines achieved a 5.6% growth in August 2009 over the same month a year earlier while KTX ridership decreased by 1.3%, a trend change credited to the opening of Seoul Subway Line 9, which improved Gimpo International Airport's connection to southern Seoul. In the first two months after the launch of the second phase of the Gyeongbu HSR, passenger numbers on flights between Gimpo and Ulsan Airports dropped 35.4% compared to the same period a year earlier, those between Gimpo and Pohang Airports 13.2%. Between Gimpo Airport and Busan's Gimhae International Airport, airline passenger numbers remained stable (+0.2%), as a consequence of a budget airline competing with large discounts and aggressive marketing. In the first month of Gyeongjeon KTX service, express bus services between Seoul and Masan or Changwon experienced 30–40% drops in ridership. Lawmakers criticised the safety of Korail's tunnels after the Ministry of Construction and Transportation submitted data to the National Assembly on June 13, 2005. The ministry added fire prevention standards to high-speed line design standards only in November 2003, thus they weren't applied to the by then finished tunnels of the first phase of KTX. Consequently, few tunnels had emergency exits, and in high-speed railway tunnels, the average walking distance in case of an emergency was 973 m (3,192 ft), with a maximum of 3,086 m (10,125 ft), against a norm of emergency exits every 500 m (1,640 ft) in other countries. A contingency plan for fires in KTX tunnels was incorporated into a national disaster manual in November 2005. On October 5, 2008, it was revealed by lawmakers that inside Hwanghak Tunnel, from December 2004, inspectors have monitored the progression of several cracks and minor track displacements, which continued after maintenance work in March–April 2007 and again in March 2008. The operator claimed that a February 2007 on-site inspection found the problems not safety-relevant, but pledged further maintenance, and an investigation into the causes was launched. Tunnel reinforcement was under way in 2010. Operation irregularities mostly concerned the rolling stock, but also signalling, power glitches and track problems. The number of incidents decreased from 28 in the first month to 8 in the fifth. The failure rate decreased sharply by the fifth year of operation. Later, in the first eight months of regular service until October 2010, KTX-II trains broke down 12 times. Causes for breakdowns in the first years of operation involved inexperienced staff and insufficient inspection during maintenance. Lawmakers from the Grand National Party published an investigation in October 2006 and expressed concern about the practice to use parts from other trains for spare parts, but Korail stated that that is standard practice in case of urgency with no safety effect, and the supply of spare parts is secured. Korail is also conducting a localisation program to develop replacements for two dozen imported parts. On June 13, 2007, near Cheongdo on the upgraded Daegu–Busan section, a damper acting between two cars of a KTX train got free at one end due to a loose screw and hit the trackbed, throwing up ballast that hit cars and caused bruises to two people on the parallel road, until the train was stopped when passengers noticed smoke. On November 3, 2007, an arriving KTX-I train collided with a parked KTX-I train inside Busan Station, resulting in material damage of 10 billion won and light injuries to two persons. The accident happened because the driver had fallen asleep and disabled the train protection system, and led to the trial and conviction of the driver. The railway union criticised single driver operation in conjunction with the two and a half hours rest time the driver had between shifts. On February 11, 2011, a KTX-Sancheon train bound for Seoul from Busan derailed on a switch in a tunnel 500 m (1,600 ft) before Gwangmyeong Station, when travelling at around 90 km/h (56 mph). No casualties were reported, only one passenger suffered slight injury, but KTX traffic was blocked for 29 hours while repairs were completed. Preliminary investigation indicated that the accident resulted from a series of human errors. Because workers improperly repaired a point along the tracks. Investigators found that the derailment was caused by a switch malfunction triggered by a loose nut from track, and suspected that a repairman failed to tighten it during maintenance the previous night. The switch's detectors signalled a problem earlier, however, a second maintenance crew failed to find the loose nut and didn't properly communicate the fact to the control center, which then allowed the train on the track. The rail union criticised Korail's use of hired repairmen. there were no problems with the train according to investigation. On July 15, 2011, 150 passengers were evacuated from a train when smoke started coming out of the train when it arrived at Miryang Station at 11:30 AM. On July 17, 2011 at around 11 AM, a train stopped abruptly and stranded some 400 passengers in the 9.975 km (6.198 mi) Hwanghak Tunnel for over an hour. The train resumed service after emergency repairs to a malfunctioning motor. A Korail spokesperson stated that the reason for the stop was due to "faults in the motor block that supplies power to the wheels". The same day, the air conditioning broke down on another train leaving Busan at 1:45 PM. Over 800 passengers were transferred to another train at Daejeon when the problem could not be fixed. On December 7, 2018, a KTX train carrying 198 passengers derailed about five minutes after leaving Gangneung for Seoul injuring 15 passengers. The train was travelling at about 103 kph when almost all of its cars left the rails. Passenger surveys in the first months found that the limited capacity of bus connections and the lack of subway connections for intermediate stations, especially the newly built stations Gwangmyeong and Cheonan-Asan, was the problem mentioned most often. A better connection to Cheonan-Asan Station was provided by an extension of Seoul Subway Line 1 along the Janghang Line, opened on December 14, 2008. Gwangmyeong Station was linked to the same subway line by a shuttle service on December 15, 2006, but it made little impact due to the longtime differences between KTX and subway train schedules. The noise level in the trains during tunnel passages was also subject to passenger complaints. A reduction by 3–4 dB was achieved by retrofitting all trains with longer mud flaps at car ends until May 2006 to smooth the airflow at the articulated car joints. However, measurements in 2009 found significantly higher interior noise levels at some locations in two tunnels. Window thickness and sound insulation was improved in the KTX-II. The isolation of KTX-I trains against pressure variations during tunnel passages was insufficient for some passengers, leading to efforts to reinforce pressurization in newer generations of trains. Some KTX passengers found high-speed travel in backwards facing seats dizzying. Swivel seats, which can be turned into the direction of travel, installed only on First Class in KTX-I trains, were made standard on both classes on newer generations of trains. ^ Cho & Chung 2008, p. 11. ^ Cho & Chung 2008, pp. 13–14. ^ a b Cho & Chung 2008, p. 14. ^ Cho & Chung 2008, pp. 14–15. ^ a b c d e f Cho & Chung 2008, p. 42. ^ a b c d e D. Suh 2000, p. 56. ^ a b c Cho & Chung 2008, p. 15. ^ a b D. Suh 2000, p. 62. ^ D. Suh 2000, p. 61. ^ D. Suh 2000, p. 58. ^ D. Suh 2000, pp. 56–57. ^ D. Suh 2000, p. 60. ^ "KTX Is a Disaster Waiting to Happen". The Chosun Ilbo. 2009-02-17. Retrieved 2010-08-28. ^ a b D. Suh et al. 2005, p. 176. ^ "Korea Catches Its A-Train, KTX". OhmyNews. 2004-03-31. Archived from the original on 2012-02-29. Retrieved 2010-08-27. ^ a b "KTX opens for commercial service". Alstom. 2004-04-01. Archived from the original on 2011-06-15. Retrieved 2010-12-31. ^ "Current Status of Korean High-Speed Rail Project". Pandrol. 2003-02-27. Archived from the original on 2011-07-22. Retrieved 2010-08-27. ^ a b Knutton, Mike (March 2004). "Korea fulfils a high-speed dream". International Railway Journal. Archived from the original on 2006-05-08. Retrieved 2010-11-04. ^ Cho & Chung 2008, pp. 15–16, 42. ^ Cho & Chung 2008, pp. 16, 26. ^ D. Suh 2000, p. 57. ^ D. Suh 2000, pp. 57–58. ^ D. Suh 2000, pp. 58–59. ^ a b "SNCF International in South Korea" (PDF). SNCF. May 2008. Archived from the original (PDF) on 2011-07-24. Retrieved 2010-08-27. ^ "Republic of Korea Seoul-Busan" (PDF). SYSTRA. Retrieved 2010-08-30. ^ 철도시설/차량 > 철도교량ㆍ터널ㆍ옹벽 현황 (in Korean). Ministry of Land, Transport and Maritime Affairs. 2009-12-31. Archived from the original on 2011-01-13. Retrieved 2011-01-13. ^ "Electricity Almanac 2009" (PDF). Korea Electric Association. Retrieved 2010-10-27. ^ a b c d e f "[KTX완전개통] 철도 '경부 대동맥' 완성(상)" (in Korean). Hankook Ilbo. 2010-10-27. Archived from the original on 2011-06-13. Retrieved 2010-11-01. ^ a b c d "Introduction of KTX". Korail. Retrieved 2010-01-18. ^ Cho & Chung 2008, p. 39. ^ Cho & Chung 2008, pp. 37, 39. ^ "국내 최장 금정터널 관통". Union Construction News. 2009-02-12. Retrieved 2010-10-26. ^ a b "Korean Risk Management Practices : a Contractor's Perspective" (PDF). World Tunnel Congress 2006. ITA-AITES. 2006. Archived from the original (PDF) on 2009-01-09. Retrieved 2010-09-02. ^ 부산 금정터널 20.3㎞ 국내 최장 (in Korean). Seoul Sinmun. 2010-04-01. Retrieved 2010-08-29. ^ "Mount Cheonseong's Background". The Dong-a Ilbo. Retrieved 2010-09-02. ^ "Supreme Court clears the way for completing high-speed rail". JoongAng Daily. 2006-06-02. Retrieved 2010-10-21. ^ "Supreme Court Clears Way for Mt.Cheonseong Tunnel". The Chosun Ilbo. 2006-06-02. Retrieved 2010-08-28. ^ "KTX 타고 서울로 생생 문화체험 떠나요" (in Korean). Busan Ilbo. 2010-11-01. Retrieved 2010-11-01. ^ 동탄~수서 12분 걸리는 고속철 만든다 (in Korean). Hankyung. 2008-06-01. Archived from the original on 2012-03-23. Retrieved 2010-11-13. ^ a b c Briginshaw, David (January 2007). "KTX takes the lead in Korea". International Railway Journal: 21–23. Retrieved 2010-10-30. ^ a b c Briginshaw, David (July 2008). "Korea's railways face a bright future". International Railway Journal: 23–26. Retrieved 2010-11-04. ^ a b c "South Korea's growing network". Railway Gazette International. 2008-09-08. Retrieved 2010-11-04. ^ a b "경전선 서울~마산간 KTX 예약ㆍ예매 알림" (in Korean). Korail. 2010-12-06. Archived from the original on 2011-07-22. Retrieved 2010-12-09. ^ "공항철도, KTX, 지하철 9호선과 직결 활성화 시킨다" (in Korean). Electimes. 2010-09-30. Retrieved 2010-10-30. ^ a b 울산～포항 복선전철건설 추진현황 (in Korean). Pohang News. 2010-01-26. Retrieved 2010-08-29. ^ a b c d "Bullet trains coming to a town near you by 2020". JoongAng Daily. 2010-09-02. Retrieved 2010-09-09. ^ "High-Speed Train to Extend Southwest Route". The Chosun Ilbo. 2006-08-23. Retrieved 2010-08-28. ^ a b c d Chung, Il-Ho (July 2006). "Plan for Honam High-Speed Railway" (PDF). Space and Environment. Korean Research Institute for Human Settlements. 25: 6–8. Archived from the original (PDF) on 2012-03-11. Retrieved 2010-08-29. ^ "Research underpins Korail's drive to be a global player". Railway Gazette International. 2007-05-01. Retrieved 2010-11-05. ^ "Railway to the future". JoongAng Daily. 2009-12-05. Retrieved 2010-08-29. ^ "호남고속철도". Korea Rail Network Authority. Archived from the original on 2012-07-27. Retrieved 2010-10-24. ^ a b "KTX ready for big expansion in 2010". JoongAng Daily. 2009-12-31. Retrieved 2010-08-29. ^ 동탄~수서 12분 걸리는 고속철 만든다 (in Korean). Hankyung. 2008-06-01. Archived from the original on 2012-03-23. Retrieved 2010-11-11. ^ 수도권 고속철 수서~평택 설계 착수 (in Korean). Maeil Business Newspaper. 2010-04-28. Archived from the original on 2012-07-16. Retrieved 2010-11-11. ^ "수서~평택 고속철도 수주…현대산업개발·GS건설" (in Korean). Hankyung. 2010-09-08. Archived from the original on 2012-03-23. Retrieved 2010-11-11. ^ a b "Korean Rail System May Include Longest Underwater Tunnel". OhmyNews. 2009-02-18. Retrieved 2010-08-29. ^ "Jeju Hesistant [sic] on Underground KTX Project". The Korea Times. 2010-01-05. Retrieved 2010-08-28. ^ "Top flights". Daily chart. The Economist. May 14, 2012. Retrieved 2012-05-14. ^ a b c d Kim, Kihwan (May 2008). "Korea develops high-speed ambitions". International Railway Journal: 35–36. Retrieved 2010-11-04. ^ "A TGV for Korea; The parties involved". Alstom. 2004-03-29. Archived from the original on 2004-04-07. Retrieved 2010-12-31. ^ a b c d e "The High Speed Rail System in Korea" (PDF). Alstom. 2004. Archived from the original (PDF) on 2004-09-12. Retrieved 2010-12-31. ^ a b "KTX 속도 시속 5km 빨라진다" (in Korean). JoongAng Ilbo. 2008-11-26. Archived from the original on 2011-07-13. Retrieved 2010-11-05. ^ Lee & Moon 2005, p. 256. ^ Lee & Moon 2005, pp. 256, 259. ^ "HSR350x looking out for name". KRRI. 2006-05-04. Archived from the original on 2011-07-21. Retrieved 2010-11-21. ^ a b Lee & Moon 2005, p. 260. ^ Lee & Moon 2005, p. 259. ^ "Trans-Korean Railway" (PDF). Korean Rail Technology (English). 1: 4–5. May–June 2005. Retrieved 2010-11-04. ^ 호남고속철도 차량 시스템 설계에 관한 연구 (PDF) (in Korean). KRRI. 2001. Archived from the original (PDF) on 2011-07-22. Retrieved 2010-11-20. ^ "Hyundai Rotem wins orders from KORAIL for commuter EMUs and further KTX-II". Newsletter. Hyundai Rotem. January 2009. Retrieved 2010-11-24. ^ "(경제안테나) '3월 운행' 차세대 KTX-II 타보니" (in Korean). SBS. 2010-02-12. Retrieved 2010-02-23. ^ 최신 반도체소자를 이용한 고속철도 차량용 추진제어 기술개발 (in Korean). Korea Institute of Construction & Transportation Technology Evaluation and Planning (KICTEP). November 2008. Archived from the original on 2012-08-03. Retrieved 2010-11-19. ^ a b c d "High Speed Trains". Rotem. October 2010. Archived from the original on 2011-07-22. Retrieved 2010-11-23. ^ "Hyundai Rotem Rolls-out World's 4th High Speed Train". Hyundai Rotem. 2008-11-25. Retrieved 2009-01-19. ^ "Pantograph SSS 400+" (PDF). Melecs MWW. Archived from the original (PDF) on 2011-07-14. Retrieved 2010-11-22. ^ "IXYS' High Power IGBTs Achieves Milestone for Performance in Fast Passenger Train..." Business Wire, AllBusiness.com. 2007-08-21. Retrieved 2008-12-31. ^ "Star of the Observeur 08". Agence pour la promotion de la création industrielle. 2008. Archived from the original on 2011-07-20. Retrieved 2008-12-31. ^ "The first front ends of the new Korean High-speed train KTX II have already arrived in Korea". Voith Turbo. 2008-06-26. Retrieved 2008-12-31. ^ "KTX-II Makes its Debut in Busan". Arirang. 2010-03-02. Retrieved 2010-08-28. ^ "Korea's 1st Homemade Bullet Train on Track in March". The Chosun Ilbo. 2010-02-12. Retrieved 2010-11-07. ^ "'KTX-산천' 오늘(2일) 첫 운행" (in Korean). Korail. 2009-03-02. Retrieved 2009-03-03. ^ KTX-Sancheon recalled after series of breakdowns. Koreatimes.co.kr (2011-05-11). Retrieved on 2013-07-12. ^ UK, DVV Media. "Hyundai Rotem awarded high speed train contracts". ^ "400 km/h High-Speed Train to be Unveiled by 2012". Next-Generation High-speed Rail Technology Center. 2009-09-21. Archived from the original on 2011-07-22. Retrieved 2010-08-28. ^ "Project Overview". Next-Generation High-speed Rail Technology Center. Archived from the original on 2011-07-22. Retrieved 2010-09-01. ^ "Development of EMU prototype train technology (II-1)". Next-Generation High-speed Rail Technology Center. Archived from the original on 2013-01-12. Retrieved 2010-09-01. ^ a b "[주간조선] KTX 진화를 거듭하다" (in Korean). The Chosun Ilbo. 2009-06-09. Retrieved 2010-09-02. ^ a b "KTX Time Table 2010.11.01" (in Korean). Korail. Retrieved 2010-10-31. ^ a b Cho & Chung 2008, p. 34. ^ a b 경부고속철도 2단계 개통에 따른 열차운행 알림 (in Korean). Korail. 2010-10-06. Archived from the original on 2011-07-22. Retrieved 2010-10-31. ^ a b c d "KTX 2010.11.01" (in Korean). Korail. Retrieved 2010-11-01. ^ "KTX 운행 조정 알림" (in Korean). Korail. 2010-11-10. Archived from the original on 2011-07-22. Retrieved 2010-12-09. ^ "KTX Time Table 2010.12.01" (in Korean). Korail. Retrieved 2010-12-09. ^ Cho & Chung 2008, p. 37. ^ "'KTX가 뭐기에'…김천·구미 끝없는 대립". JoongAng Ilbo. 2010-07-18. Archived from the original on 2011-07-13. Retrieved 2010-10-23. ^ Cho & Chung 2008, p. 40. ^ "KTX Time Table 2010.12.15" (in Korean). Korail. Retrieved 2010-12-11. ^ "KTX 2010.12.15" (in Korean). Korail. Retrieved 2010-12-11. ^ "여수엑스포 SOC 사업, 속도 낸다" (in Korean). The Chosun Ilbo. 2011-02-17. Retrieved 2011-02-20. ^ 숙박ㆍ교통ㆍ민자 사업 어디까지 왔나 어디를 가도 '여수는 지금 공사중' 2조원 투입해 2년간 단계별 건립 도심연결 도로망ㆍ교통혼잡은 숙제 (in Korean). The Chosun Ilbo. 2010-05-12. Archived from the original on 2013-01-03. Retrieved 2010-10-19. ^ 2015년 포항~서울 2시간에 달린다 (in Korean). JoongAng Ilbo. 2010-02-04. Archived from the original on 2011-07-13. Retrieved 2010-11-05. ^ "Booking". Korail. Archived from the original on 2011-07-13. Retrieved 2010-10-26. ^ "Bullet Train to Feature Latest Films". The Chosun Ilbo. 2006-09-21. Retrieved 2010-11-01. ^ a b D. Suh et al. 2005, p. 179. ^ "KTX 운임 및 예매기간 조정 알림" (in Korean). Korail. 2005-04-30. Archived from the original on 2011-07-22. Retrieved 2010-11-04. ^ Cho & Chung 2008, p. 19. ^ "Saemaul 2010.09.01" (in Korean). Korail. Retrieved 2010-10-31. ^ "Mugunghwa 2010.09.01" (in Korean). Korail. Retrieved 2010-10-31. ^ a b "Public Service Fees to Rise". Korea.net via United Nations Public Administration Network. 2006-10-30. Retrieved 2010-08-30. ^ "Growth Could Fall on North Tensions". The Dong-a Ilbo. 2006-10-30. Retrieved 2010-09-03. ^ a b "Train Fares to Increase 4.2% From July 1". The Korea Times. 2007-06-22. Retrieved 2010-08-30. ^ a b c d e f 할인제도 (in Korean). Korail. Archived from the original on 2013-01-27. Retrieved 2010-11-05. ^ "Korea Rail Pass". Korail. Retrieved 2010-10-28. ^ "Bullet trains are attracting foreigners". JoongAng Daily. 2009-04-27. Retrieved 2009-04-26. ^ "Foreign Railroad Traveling". Korail. Retrieved 2010-10-28. ^ a b 한국고속철도 개통효과와 균등분배정책. Korean Rail Technology (in Korean) (46). March–April 2004. Retrieved 2010-11-04. ^ a b D. Suh et al. 2005, p. 183. ^ a b "Bullet Train KTX Records Only Half of Expectations". The Chosun Ilbo. 2004-07-09. Retrieved 2010-08-27. ^ "Daegu-Busan KTX Route Completed". The Chosun Ilbo. 2010-11-29. Retrieved 2010-11-01. ^ 경부고속철은 정책실패…호남고속철 섣불리 건설 못해 (in Korean). OhmyNews. 2005-01-14. Retrieved 2010-11-01. ^ Cho & Chung 2008, p. 20. ^ "KTX Carries 100,000 Passengers a Day". The Chosun Ilbo. 2006-01-09. Retrieved 2010-11-01. ^ "KTX이용객 1억명 돌파" (in Korean). Korail. 2007-04-21. Retrieved 2010-10-30. ^ "Korea's Bullet Trains Celebrates 4th Year". The Chosun Ilbo. 2008-04-02. Archived from the original on 2008-05-24. Retrieved 2009-02-24. ^ MUN, Jinsu (2010-05-25). "High Speed Rail in Korea" (PDF). The Korea Transport Institute. Archived from the original (PDF) on 2011-07-25. Retrieved 2010-10-21. ^ a b c "개통 6년을 맞는 KTX의 현재와 미래" (in Korean). Korail. 2010-03-29. Retrieved 2010-04-21. ^ a b c d e "KTX 개통 5주년 보도자료" (in Korean). Rail Safety Information System. 2009-04-01. Archived from the original on 2010-11-11. Retrieved 2010-11-13. ^ "KTX Clocks Up Over 414 Million Passengers in a Decade". ^ Cho & Chung 2008, pp. 29–32. ^ "Muan International Airport Has Incomplete Opening". The Korea Times. 2007-11-08. Retrieved 2010-10-21. ^ "Bullet trains steal planes' thunder". JoongAng Daily. 2009-04-02. Retrieved 2009-11-30. ^ "Budget Carriers Gear Up to Challenge KTX". The Korea Times. 2008-12-25. Retrieved 2008-12-31. ^ "Budget airlines win passengers again". JoongAng Daily. 2009-10-21. Retrieved 2009-11-30. ^ a b "KTX 2단계 개통후 울산-포항 항공객 급감" (in Korean). The Chosun Ilbo. 2011-01-09. Retrieved 2011-01-18. ^ "경전선 KTX 개통 한달..경남에 '변화의 바람'" (in Korean). The Chosun Ilbo. 2011-01-14. Archived from the original on 2012-03-19. Retrieved 2011-01-18. ^ "What If There Is a Fire in a Railroad Tunnel?". The Dong-a Ilbo. 2005-06-14. Retrieved 2010-09-02. ^ "New Disaster Manuals Outline Emergency Response". The Chosun Ilbo. 2005-11-29. Retrieved 2010-11-01. ^ "KTX궤도 뒤틀려···안전 비상". Construction Daily News. 2008-10-06. Archived from the original on 2011-07-22. Retrieved 2010-09-03. ^ 수서~평택, 수도권 고속철도 안전성 '취약' (in Korean). MBN TV. 2010-03-02. Retrieved 2010-10-30. ^ a b D. Suh et al. 2005, p. 180. ^ "Korail under fire for frequent KTX breakdowns". The Korea Times. 2010-10-28. Retrieved 2010-10-30. ^ "KTX '터널안 정차' 기관사 조치미숙으로 최종 결론" (in Korean). OhmyNews. 2005-02-16. Retrieved 2010-10-29. ^ "고속철 '불안한 질주' 언제까지…'터널속 정차' 원인 못밝혀". The Dong-a Ilbo. 2005-02-11. Retrieved 2010-10-29. ^ "KTX 고장나면 다른 차량 부품 떼어 "땜질"" (in Korean). Prime Business Journal. 2006-10-13. Archived from the original on 2011-07-22. Retrieved 2011-02-12. ^ "Head-on Collision". The Dong-a Ilbo. 2007-11-05. Retrieved 2007-11-05. ^ "부산 KTX 충돌사고 기관사 등 사전영장" (in Korean). Hankyung. 2007-11-15. Archived from the original on 2012-03-23. Retrieved 2011-01-13. ^ a b "KTX열차 정면충돌, 대형참사로 이어질뻔" (in Korean). Korea Broadcasting Network. 2007-11-03. Retrieved 2010-09-25. ^ "KTX 부산역 구내 충돌사고 원인은" (in Korean). Busan Ilbo. 2007-11-05. Retrieved 2010-09-25. ^ "부산역 KTX 충돌사고 기관사 벌금형" (in Korean). Maeil Business Newspaper. 2008-06-13. Archived from the original on 2012-07-22. Retrieved 2011-01-01. ^ a b "KTX causes safety concern". The Korea Times. 2011-02-14. Retrieved 2011-02-17. ^ a b c d e "One loose nut derailed KTX train". Joongang Ilbo. 2011-02-15. Retrieved 2011-02-17. ^ "고속이었다면 KTX 참사 날 뻔". The Dong-a Ilbo. 2011-02-11. Retrieved 2011-02-11. ^ a b "KTX Derailment Caused by Loose Nut". The Chosun Ilbo. 2011-02-14. Retrieved 2011-02-14. ^ a b c "3 Disruptions in a Weekend Add to Bullet Train's Woes". The Chosun Ilbo. 2011-07-18. Retrieved 2011-07-18. ^ "2 KTX trains break down in space of hours". Asia One. 2011-07-18. Retrieved 2011-07-18. ^ "High-speed train halted for hour inside tunnel". Yonhap News Agency. 2011-07-17. Retrieved 2011-07-18. ^ a b "One year later, KTX faces rider shortfalls, complaints". JoongAng Daily. 2005-03-25. Retrieved 2010-10-21. ^ D. Suh et al. 2005, pp. 186–187. ^ 장항선 천안-신창 복선전철 개통 (in Korean). The Dong-a Ilbo. 2008-12-14. Archived from the original on 2013-01-21. Retrieved 2010-10-29. ^ "KTX, 영등포역 등 정차… "정부에 속았다" 광명시 부글부글" (in Korean). Gyeonggi Ilbo. 2010-10-27. Retrieved 2010-11-13. ^ "한 칸 승객 2명 … 공기만 싣고 달린다". JoongAng Ilbo. 2008-07-07. Archived from the original on 2011-07-13. Retrieved 2010-10-29. ^ a b "KTX터널소음 개선". Korail. 2005-10-06. Archived from the original on 2011-07-22. Retrieved 2010-11-13. ^ "KTX '총체적' 부실시공 의혹" (in Korean). Daegu Ilbo. 2009-02-22. Archived from the original on 2011-07-18. Retrieved 2010-11-13. ^ a b D. Suh et al. 2005, p. 182. ^ "KTX passengers rise 47% over a five-year duration". JoongAng Daily. 2009-04-01. Retrieved 2009-04-30. D. Suh, Sunduck; Yang, Keun-Yul; Lee, Jae-Hoon; Ahn, Byung-Min; Kim, Jeong Hyun (2005). "Effects of Korean Train Express (KTX) Operation on the National Transport System" (PDF). Proceedings of the Eastern Asia Society for Transportation Studies. 5: 175–189. Retrieved 2011-02-13. Lee, Hisung; Moon, Dae-Seop (2005). "Next Generation of Korea Train Express (KTX): Prospect and Strategies" (PDF). Proceedings of the Eastern Asia Society for Transportation Studies. 5: 255–262. Retrieved 2011-02-13. Cho, Nam-Geon; Chung, Jin-Kyu (2008). "High Speed Rail Construction of Korea and Its Impact" (PDF). KRIHS Special Report Series. Korea Research Institute for Human Settlements. 12. Archived from the original (PDF) on 2011-05-29. Retrieved 2011-02-13. Wikimedia Commons has media related to Korea Train Express. Wikivoyage has a travel guide for High speed rail in South Korea. Kim, Chun-Hwan (May 2005). "Transportation Revolution: The Korean High-speed Railway" (PDF). Japan Railway & Transport Review (40): 8–13. Archived from the original (PDF) on 2011-05-16. Retrieved 2010-08-28.